We have both a sanctuary and fellowship space with a kitchen and a separate building available for use by non-profit groups. Please contact us by email at churchoffice@pacificgrovechurch.org. Thousands of couples have found our sanctuary to be the perfect place for a beautiful and intimate wedding ceremony. Not too surprising when you consider that we are located just a short coastal walk from Lover’s Point. To plan a Pacific Grove wedding, call our church office at (831) 372-0363 to confirm a date and to talk about the cost. – remember that our sanctuary comfortably seats 108 people. – the Summer weekends book up fast, so schedule as far in advance as possible. 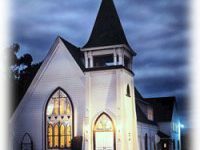 – our pastor requires adequate time to visit with the couple and to plan the details of the ceremony prior to the wedding day. The pastor does not use this time to espouse church membership or denominational affiliation. He is, however, trained to lead a pre-marital counseling process that couples are strongly urged to consider. – If you wish this ceremony to be legally binding, you will need to acquire marriage license paperwork from the State of California. – We do keep information on local photographers, florists and other professionals who have proven to do outstanding work. – A wedding in our 126 person occupancy sanctuary, including wedding hostess, minister and organist is $1200. A reception in our 54 person occupancy fellowship hall is $300.